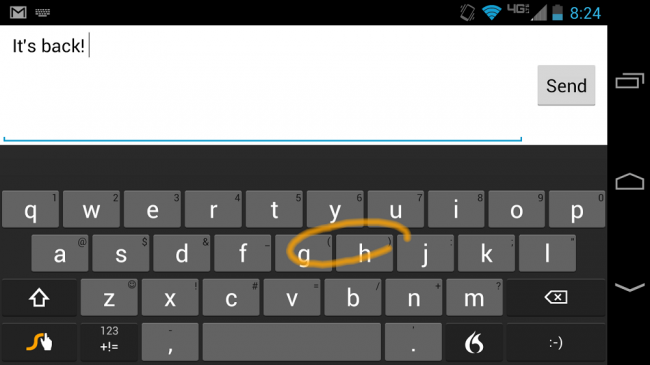 This morning we awoke to the pleasant surprise of seeing the Swype keyboard gracing Google Play. For those who have been around here for a while, you will know Swype as the original swipe-based keyboard that allows you to drag your finger from key to key, to create words and turn anyone into a speed texting machine. While it seems every keyboard company has now implemented a swiping feature, I will hold fast in believing Swype should be known as the “OG” in this department. There is a paid version of the keyboard available for a limited time at just $0.99, while a free version is available for a trial period. The keyboard seems to perform quite well, not showing any lag or performance hiccups. And in terms of looks, it gives off a stock Android feel with some orange flare, which you won’t see my complaining about. Check it out for old time’s sake.